When it comes the marketing game, business owners have to really wise up in the medium and materials that they use to push their brand. Sometimes, the most effective method doesn’t really come in the form of extravagant gimmicks, but in the shape of little tokens instead—these little tokens, which often include custom matchbooks. While you may not have considered matches as a suitable and effective form of promotional items, you’d be surprised at how beneficial it can be in the long run. Much like any other form of promotional item, it’s all about increasing awareness for your brand. The great thing about matchbooks is how it can be so much more usable than your typical calling cards, flyers, brochures, and whatnot. It’s simple, straight to the point, and your customers can actually have a use for it instead of just throwing or misplacing it. Just place your logo front and center and on the back put your contact details and other relevant information, and see how far even just one matchbox can take your business. Don’t undermine the usefulness of matches. Just imagine from the point that you hand it out to a customer, they then place it inside their bags or pockets. After which, they get home and take it out and instead of throwing it, they place it on the countertop for future use. They can also head out to other places and meet other people and remember that they have it on them, and it could make for a small topic of conversation as well. If they have extra pieces on them, they could also give them away. There are many options in which matchbooks could reach a lot of people, therefore expanding the influence of the name of your brand. One of the main dilemmas of small-scale businesses is not having enough funds for marketing. Matchbooks are an ideal promotional expenditure because they are so much more affordable than having to invest in already big-time forms of marketing. The fact that it’s more personal is quite an advantageous bonus as well. Don’t know where to start? 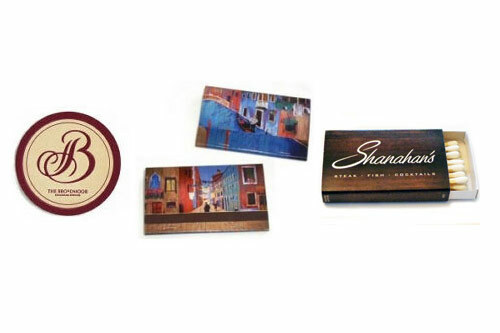 You can easily find a reliable supplier of custom-made matchbooks online. In this case, you won’t even have to leave the comfort of your seat and just basically leave it to them to deliver high quality, customized matchbooks. How to order? All you need to do is come up with your unique design template and decide on the colors and the shape of the box, as well as the quantity. It really is as easy as that and you can have your custom matchbooks in no time ready to be given away to your target customers.